Our drum instructors teach rock, metal, jazz, funk, blues, and more. Our instructors want to get to know each student and learn about their music preferences and aspirations. The teacher paces the lessons material appropriately for each student. Technique is emphasized so that the drummer can have the control to be a dynamic, creative player. Drummers are invited to bring in their favorite drum parts to learn in the lessons. Your instructor will be there to help you prepare for auditions and band commitments. 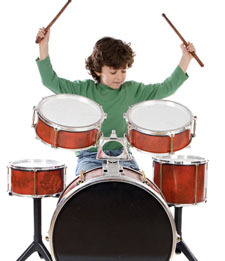 You do not have to purchase a drum set initially to take lessons. Beginning students can learn with a drum pad and sticks for only $25.00.